517-449-2638 Tracker Jeff will track in Clinton,Ingham,Eaton Counties. Will travel when available. 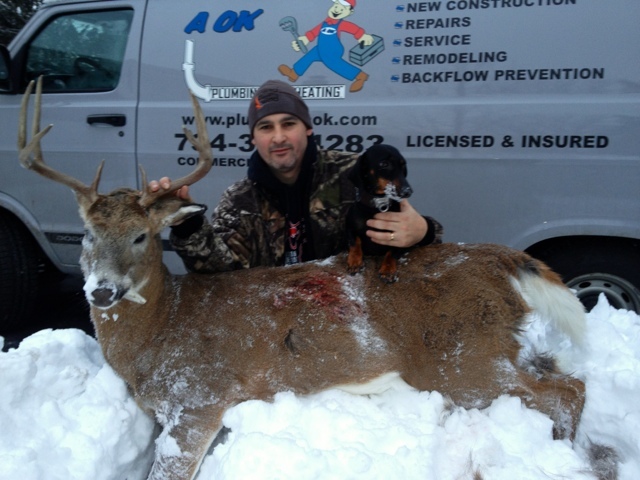 Not to many times as a tracker you get feed back after you track a deer for your clients. In this case I was informed after tracking this buck back in October that he was seen on a trail camera. Butch shot this buck with a quartering away shot with a hit entry and he could see his illuminated knock sticking out of the buck side as he ran off. Butch called me that night with several concerns. 1st concern was he was not sure how much penetration the arrow got!!! 2nd the weather was looking like rain.!!! 3rd was can a hound track after it has rained. expire so we would meet up a day break (still raining out) Sypris quickly locked on and off we went. 100-200-300 yards in to the track I found some blood. From here she started tracking in to a subdivision and I know she is correct because I could see the giant hoof prints. I told butch that he must have single lunged him and you will see him again!! Two weeks later he showed up on his trail camera. Butch was extremely happy. 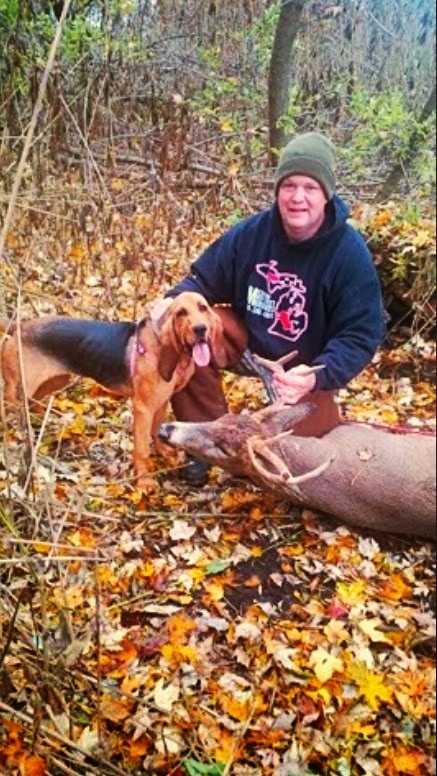 Second to the last day of Michigan bow season and the last night Butch could hunt the buck showed up just before dark. 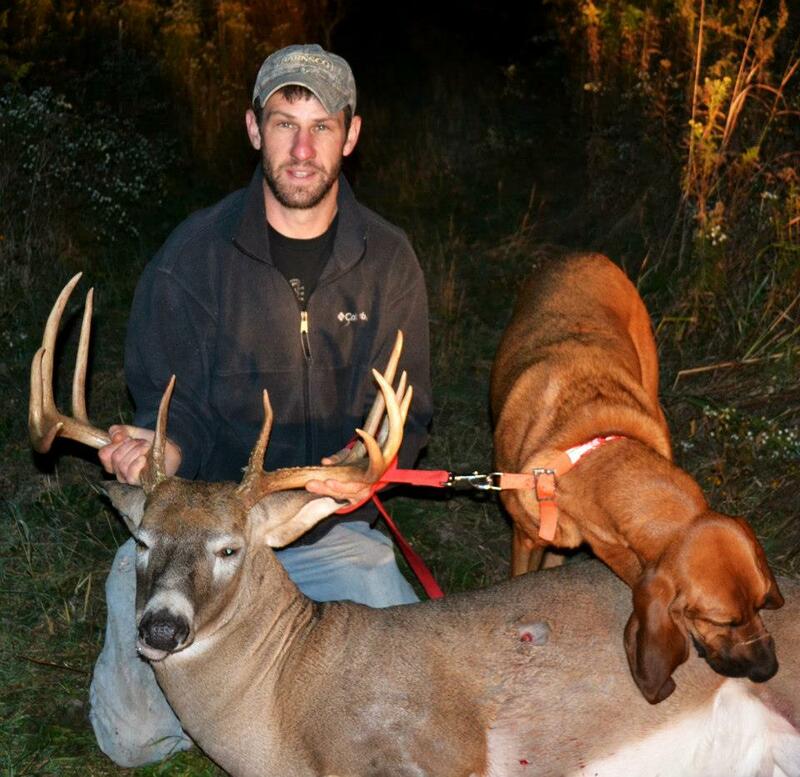 Butch could not believe he was going to get a second chance at this giant 9 point. Butch comes to full draw and takes the shot!! The buck blasted away!!! He calls me and says Rob I got him I got him I can't believe I got him!!!! I showed up at day break and we went to his treestand and we found hair and extremely dark blood. Butch points in the direction the buck went and there was 3 doe heading our way. (I'm thinking great live deer walking over the bucks wounded path) so we started tracking and the three doe ran off(Sypris was so focused the live deer had no affect on her) Sypris indicated on some hair and chunk of meat to confirm she knew which deer to track. Take in mind it is 7 degrees out!!! 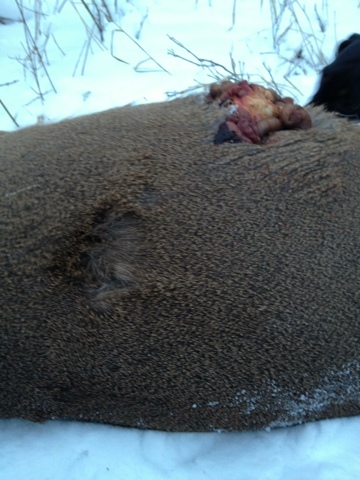 She tracked this buck 400-500 yards and I only found two very small blood drops. 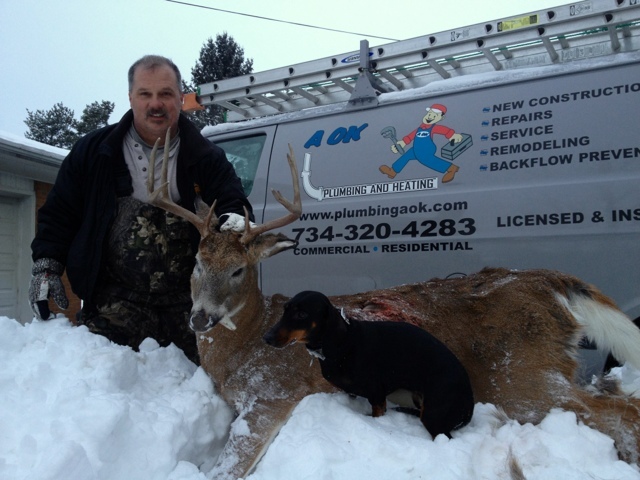 The buck ran through 4 yards and died in between two houses. 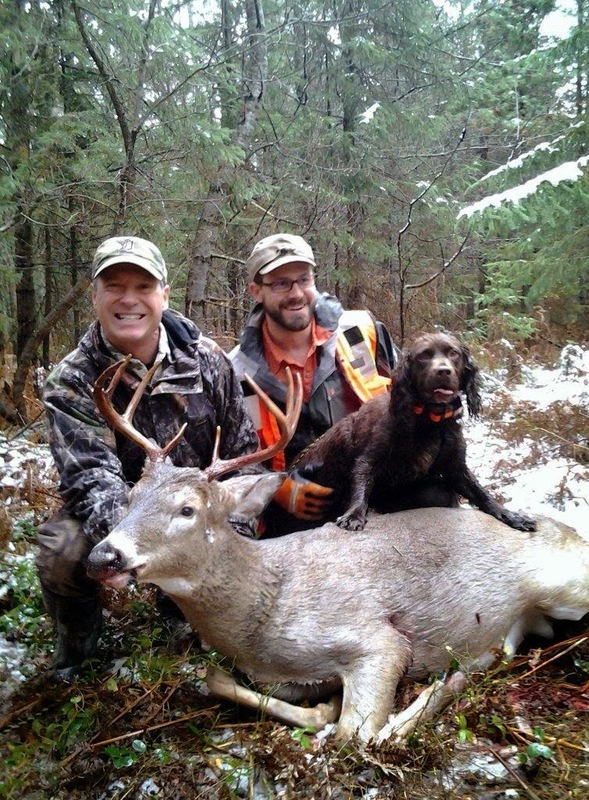 Butch told me He would have never looked over there and he would have never found this buck. The first shot was stopped by a rib bone. Second shot was 1 lung/liver/gut.